I ended up writing more than expected, mostly to keep track of things for my future self. There may be some places where I have too many pictures, others where there aren’t enough. Most of what I noted here are details of my sights and observations, but there are far more ideas and thoughts having to do with culture that I will write about soon. The Japanese, and specifically those in Tokyo, have some strange tendencies, like not eating or smoking on public streets, although they smoke like chimneys outside the convenience stores. Overall, everyone was extremely respectful and helpful, the city is immaculately clean, and worker mentality is strong and present throughout the city. I got my luggage and worked my way to the subway, an hour trip from my hotel for the night, not far from Tokyo station. My phone will be on airplane mode for the trip as I should be capable with wireless at airports, coffee shops, and hostels. Thankfully GPS works without data, so I search for my destination with wifi and watch my progress on Google Maps while walking around. On the train, about half of the people are wearing face masks, which I’d learn are to protect them from an allergy to pollen, not to protect others from their illness or themselves from pollution. I arrived fairly late and grabbed some quick food (sushi triangles and a pastry) and a few beers at 7-11 before heading to my hotel. 7-11s are on every corner in Tokyo, and Japan for that matter. Cigarette and bottled drink machines are also ubiquitous, far more than I’ve seen in the States, and the variety of cigarette brands is multiple times as great. The next morning I headed to my hostel where I’d be for the next three nights and ventured out for some sightseeing. 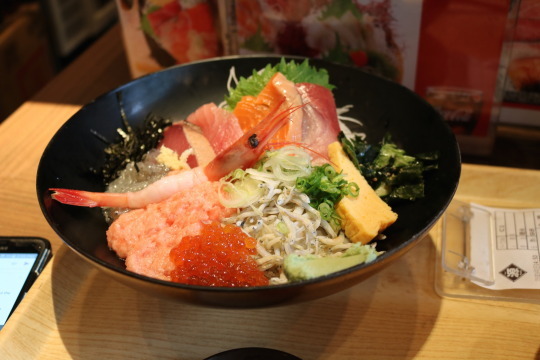 As I said before, I hadn’t done much research but was given a few places that were must see, Akihabara, the Meiji shrine, a few hipster areas of the city that have cool shops and definitely the largest fish market in the world, Tsukiji Market. 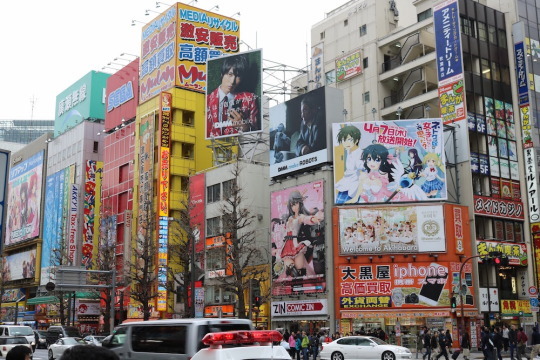 I made my first moves up to Akihabara, the anime and electronic centers of the city. First step was to grab some sushi, finally sinking myself into good food almost 16 hours after arriving in Japan and realized here that I would get by just fine in the city without speaking Japanese. It’s tedious, but nearly all menus had pictures and a few basic greetings were enough to get what I needed while being polite. 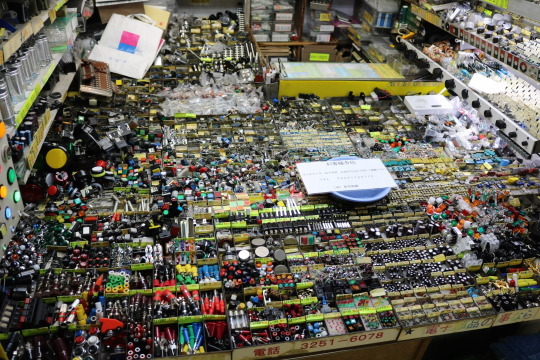 After eating, I checked out a few electronic and anime markets, more intense than I expected. Possibly the biggest surprise was a small bazaar right off one of the main streets which sells all of the resistors and LED lights you would need to build some sweet electronics. When I left these shops, I looked up to notice maid cafes where lonely guys get waited on and revered by young women dressed in caricature maid outfits. This was super weird but not entirely surprising. From here, in the north central part of the city, I walked counterclockwise toward the Meji shrine. Tokyo has a sprawling, fast subway system but I’ve always preferred to walk and get a feel for the speed, sounds, and energy of places I visit. I think the quality of public transportation, efficiency of traffic, and high cost of living pushes most off the sidewalks, so there were many areas in my ambling where I was the only one walking. I’m happy I made the decision as it allowed me to see a ton of shops, restaurants, schools, and fields that I otherwise would have missed. Among these, I walked past a row of ski and snowboard stores, larger and of higher quality that I’ve seen anywhere in the US, including mountain towns. Tokyo clearly has a wealthy population. One of the most notable differences between Tokyo and the cities where I’ve lived in the US, particularly New York and San Francisco, is the lack of diversity. Everyone seems to be upper middle class, or at least dresses that way. Many groups of men are walking around in dark suits, but those my age are also dressed well, in the popular brands I know from home. It’s not surprising the clothes and dress are nice, it’s surprising that everyone fits the mold. I didn’t see a single homeless person until my third day in Tokyo, and even then it was only a single guy catching some rest. While I can’t tell the difference between the many Asian faces, there are very few people that are not Asian and the manners and consistencies suggest most are Japanese. During my walk, I was sidetracked by an old palace, which received a lot of tourist (still Japanese) attention because it is situated on a small lake lined by cherry blossoms. 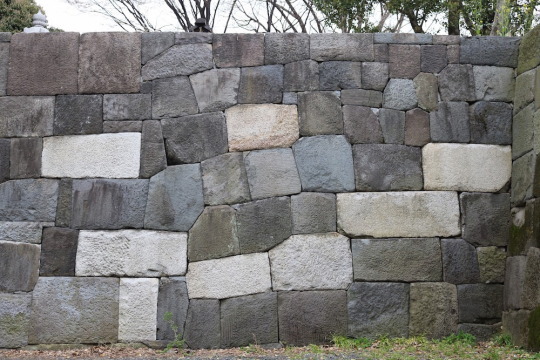 The attention to detail and amount of work put into this place was evident by the walls which welcomed us to the palace, built of gigantic stones intricately and beautifully fit together. 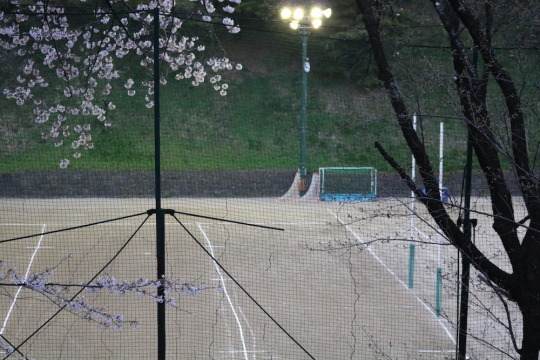 This is where I first felt the crowdedness of the city and obsession with the cherry blossoms. A small food festival located at an adjacent shrine was full of people, most of whom were picnicking on blue tarps, sitting with shoes off in a circle, drinking and eating. I kept my stroll on and made my way past some parks and sat down to watch a little intramural softball and tennis. 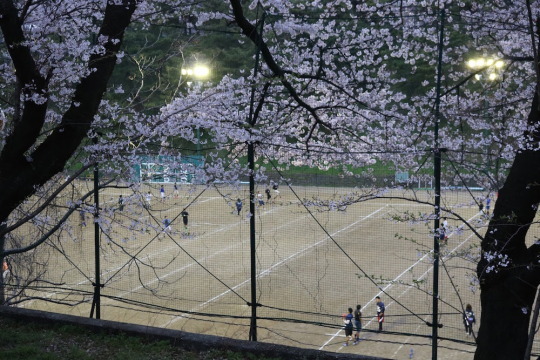 Next, I passed a high school field, where an American football practice was just beginning and guys screamed in calisthenic lines wearing football pants. A few lax cages in the corner made it feel like home. An entire bank of cherry blossoms and screaming Japanese kids made it feel like Tokyo. I finally took a break at the most Western looking bar I could find, Le Mermaid, and collapsed at the happy hour to a nice big beer. It was a great choice, and the only other person sitting at the bar was an English speaking Japanese man that told me he’s been to San Francisco several times as a freelance sound engineer. The entire bar staff spoke English well too, which led to me hanging out and having a few more drinks than I planned. I left after two hours or so to meet a friend of a friend in the exPat part of town, a huge office building where we had expensive cocktails at a bar on an upper floor. It was great to talk with an American and hear about her time in Tokyo, but I prefer the locals. The next day, I again hunted out quality Japanese food and walked to a few small areas of Japan with tons of character. I began at a huge department store, amazed at the materialism, but as someone who rarely goes to malls in the US, I’m probably overemphasizing it. I had an awesome panko crusted pork dish, and headed out for some more walking. 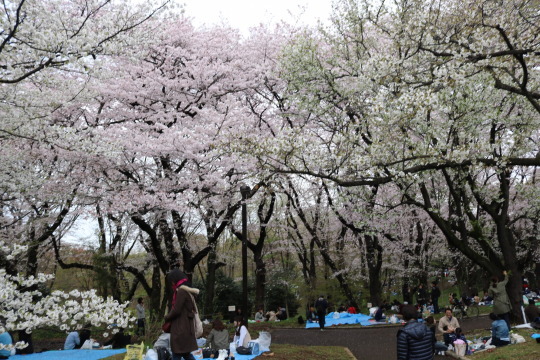 I finally made my way to some larger parks, where the cherry blossoms still dominated, there were tents selling food, and no less than 5,000 Japanese picnicked on tarps. The weather wasn’t as nice as I would hope for some outdoor drinking but the bloom was in full effect and the locals weren’t being stopped. From here, I walked a few miles west on small streets though residential areas until finally reaching my destination, a small hipster town without the large buildings at the center of city. 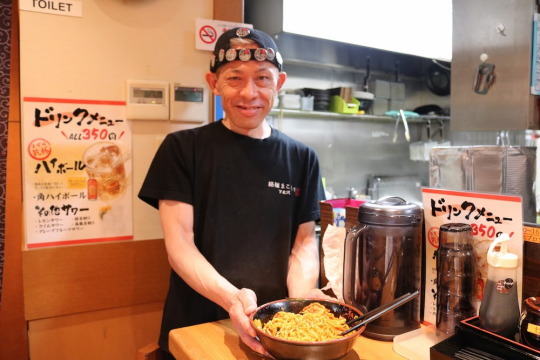 I popped into a few shops selling fashionable gear and finally picked out my next meal, a ramen bar that seated less than 10 people and only had one employee, the 50 year old host/chef/bartender/cashier. This guy spoke almost zero English, but the machine where I bought my food ticket had pictures and that was enough. By the time I sat down, the two other diners had left and it was just the two of us remaining. I began reading until my meal came, at which point the chef stood and watched me eat. Luckily, the dish was awesome, and the guy was super happy to have me there. We shared some laughs as he showed me I should mix everything up, I took a picture of him with the food, and I scarfed down the bowl with ease. Up to that point, this was the moment of the trip, realizing how easy it is to converse with people over food, gestures, and smiles. You never know what people will sell in a foreign country. This was the only US college gear I’ve seen my entire time in Asia, fitting. I got to sleep before 10pm to wake up for the fish market, where I’d read the tuna auction spots are usually gone between 3am and 4am. I walked the 30 minutes in the rain to the market, arriving at 3:45, only to find out the auction spots were gone by 2:30am. Next, I stood on line at Sushi Dai, one of the highest rated sushi restaurants in the country, located next to the market. Everyone in line was a tourist, probably half coming from a night out. I heard rumblings that the wait could be multiple hours, but it wasn’t until 1.5 hours of waiting and the end of a book that a chef came out and said my point in line would need to wait five more hours before being seated. Not happening. 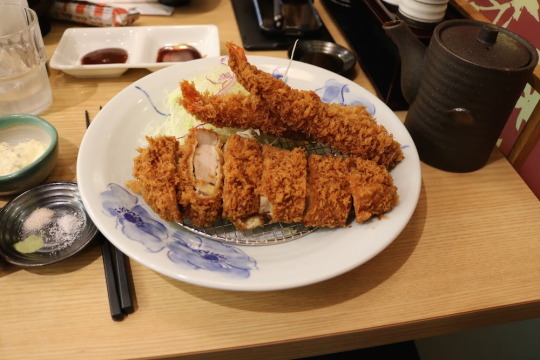 I headed to one of the many other sushi restaurants at around 6am, had an awesome meal, and continued to eat my way through the restaurant area in the pouring rain. These weren’t restaurants so much as sushi bars, most fitting only half a dozen people and several serving directly from their storefront. The first place I chose felt overpriced, but I chatted with a few Americans and the food was awesome. Next, I grabbed some great, torch cooked scallops and tuna and headed to Starbucks to wait for the 9am opening of market. When I finally got back to the market, the small vehicles I saw at 4am were still buzzing around the alleys, now teeming with people as well. The market is gigantic and covers more space than I realized early on, selling every fish you could imagine. 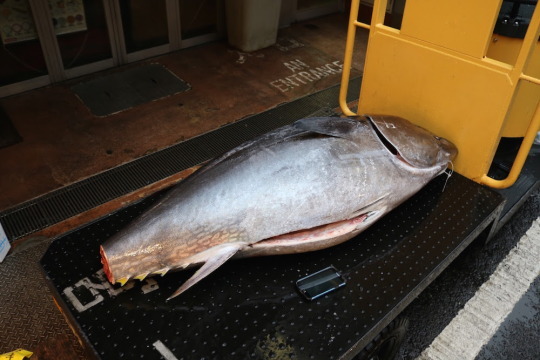 Huge, shock frozen tunas were cut and packed for delivery but the majority was fresh seafood, most of which was being sold, packed, and shipped to large buyers. 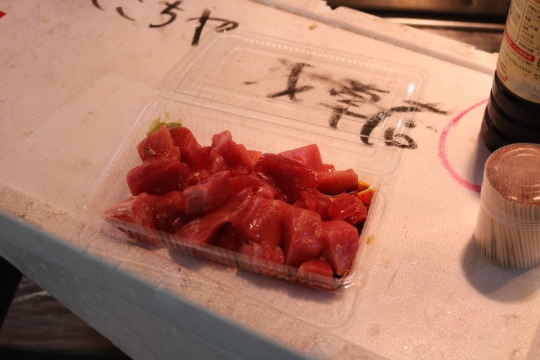 A few places had some cuts for tourists, and the fresh tuna I picked up was some of the best fish I’ve eaten, super simple with a toothpick, soy sauce, and wasabi. I left the market, headed back to the hostel for a shower, and back out to meet some friends throughout the city. Unfortunately, this was where not having cell service really started to take its toll. I rushed from Starbucks to Starbucks, seeking out wifi to try to catch up with a friend on the move. We finally agreed on a meeting beneath Tokyo Tower, chatted for 5 minutes because I was lost for an hour, then I headed to Shibuya, to meet a Japanese friend of my brother’s, Kohta. After a few drinks, I left to meet another friend of my brothers, Kosuke, a 34 year old alumni lacrosse player of the same college Kohta attended. He brought me to a restaurant situated below an art gallery he supports, where the food was unreal, from top notch sushi to kobe beef sashimi. There were two other current laxers and another alumni, a 2010 grad as well. The next day, I would leave Tokyo for Hakone, located near Mt. Fuji, to check out the countryside and begin my journey toward Osaka. As you can tell, it was a hell of a few days in Japan’s largest city.